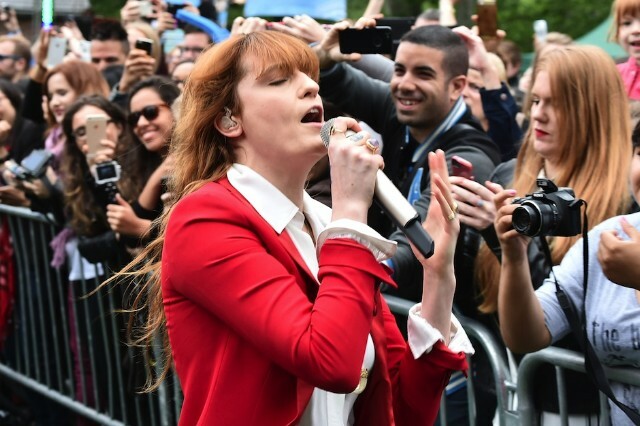 Florence + the Machine’s live performances over the last couple of months have been hamstrung by singer Florence Welch’s broken foot, but the band still made their way to Good Morning America today. By all indications, they seem to be back in fighting shape. During a brief set that aired at the same time another British pop star, Charli XCX, was rocking The Today Show, Florence and co. performed “Ship to Wreck” and “What Kind of Man,” from this week’s How Big, How Blue, How Beautiful. While belting out the latter track, Welch hopped off from the stage and ran along the barrier, just like she would’ve pre-injury. It’s a reminder that at full-strength, Welch is a performer to be reckoned with. Watch videos of those performances, plus a rendition of “Dog Days Are Over” here.